Rich Tool Systems sells high quality premium sandpaper. Our assortment of 6" stick-on sandpaper discs are tough enough to get the job done. The grit is composed of hardened aluminum oxide for efficient cutting and the discs are treated with a powerful anti-clogging additive to prevent them from becoming loaded with dust. We carry 80 grit, 120 grit, 180 grit, 240 grit, 320 grit, 400 grit, 600 grit, 800 grit, 1000 grit, and 1200 grit to provide you with the sandpaper you need. 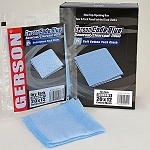 We also have the foam backup pad you can use to sand concave surfaces.